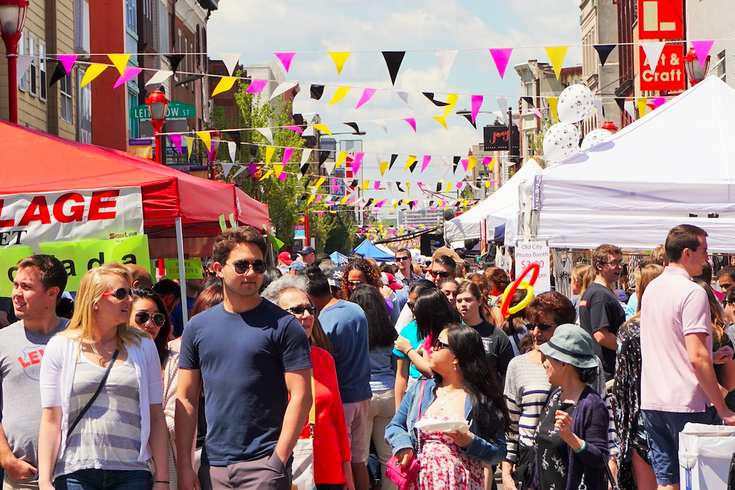 The South Street Spring Festival will return on Saturday, May 6. At the free outdoor block party, there will be more than 30 participating bars and restaurants, over 125 shopping vendors and 40 bands on three stages. Plus, as part of the festival, there will be Brauhaus Schmitz's Maifest, Atomic City Comics' Comic Book Day and the Philly Taco Eating Contest. The challenge, which began last year, is to be first to finish a "Philly Taco." 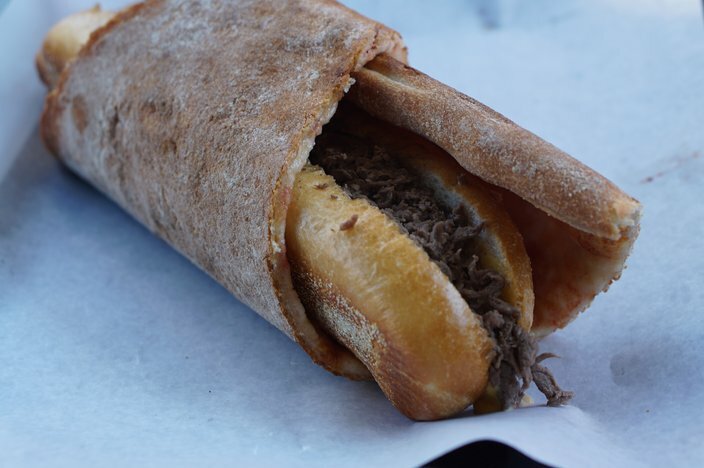 The delicacy is a Jim's cheesesteak wrapped inside a Lorenzo's pizza slice. Whoever wins will receive a year's worth of cheesesteaks and pizza. The contest will be open to the first 20 contestants to sign up. Participants will also need to pay a $20 fee, which will be donated to a local school lunch program. Sign up by emailing Festival@southstreet.com with the subject "Taco Contest." Dare to try the Philly Taco? As for the festival's soundtrack, a mix of rock, funk, soul, hip-hop, indie rock, reggae, R&B and country acts will entertain crowds. "We are proud to host one of the city's largest free concerts that celebrates the same energy and creativity that has always electrified South Street,” Bill Arrowood, South Street Headhouse District's assistant director, stated. Below is this year's music schedule. 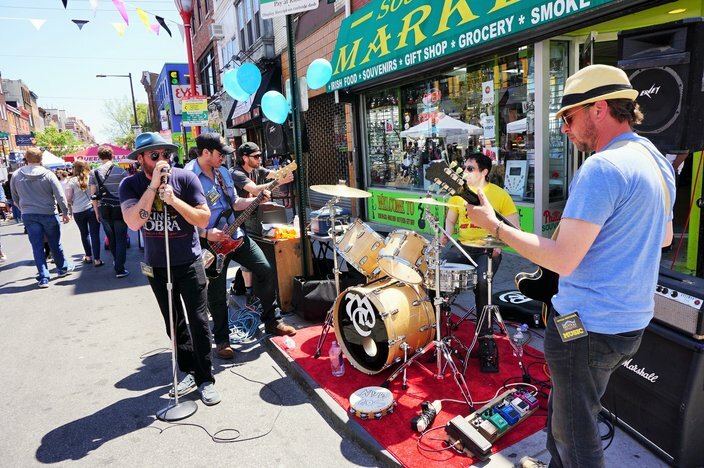 A band plays during the South Street Spring Festival. May 2, 2015. Each year, the festival draws crowds of more than 50,000. It has officially become the largest springtime festival in the city. To feed the large crowds, there will be al fresco dining from neighborhood favorites. View the full lineup of participating restaurants, food trucks and speciality food vendors below, along with info on Brauhaus Schmitz's Maifest. During Brauhaus Schmitz's Maifest, guests can enjoy traditional German fare and German beer. In addition, there will be traditional German dancers from 2-6 p.m., a maypole dance at 2:45 p.m. and live music from 1-6 p.m. There will also be a Philadelphia's Magic Gardens booth, where visitors can make flower crowns. PhillyVoice is a media sponsor of this year’s festival.